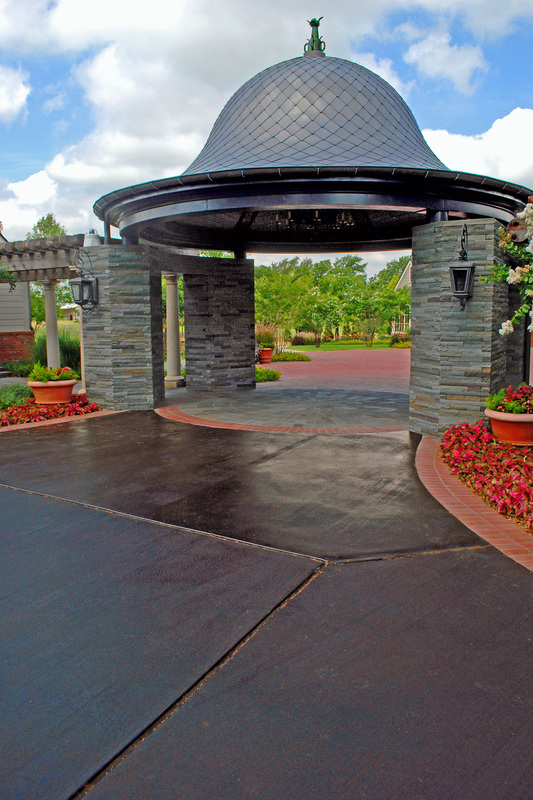 Outdoor concrete is ideal for decorative applications such as staining and sealing. 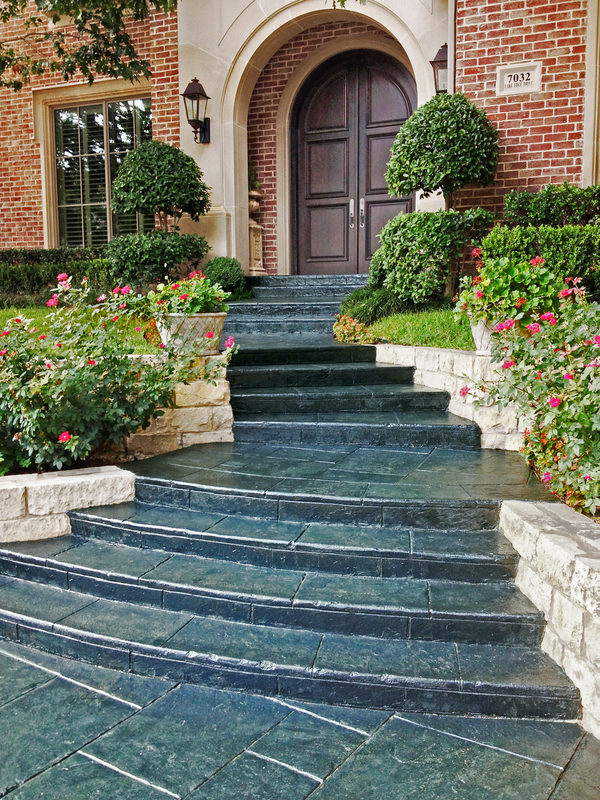 We specialize in coloring exterior surfaces with acid and non-reactive stains, and applying clear and tinted protective sealers formulated for the demanding conditions and textures typical of exterior concrete. 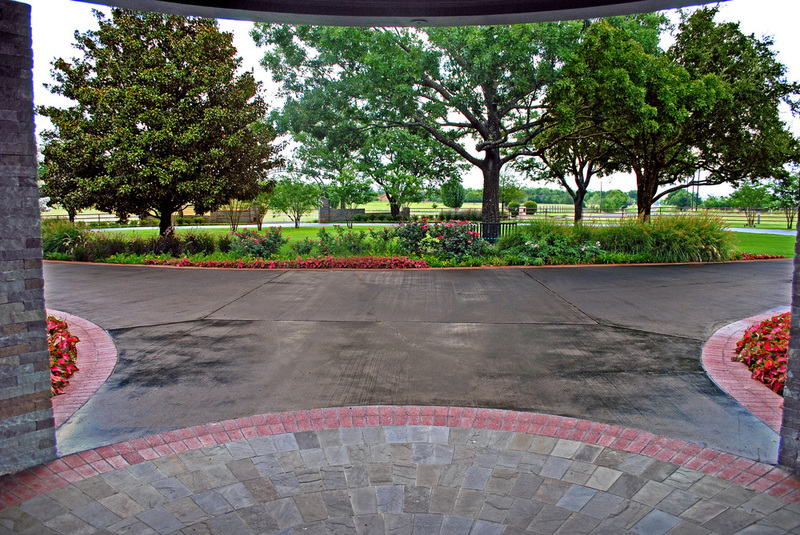 Virtually all interior options - custom colors, scoring, concrete overlays - are also available with exterior. 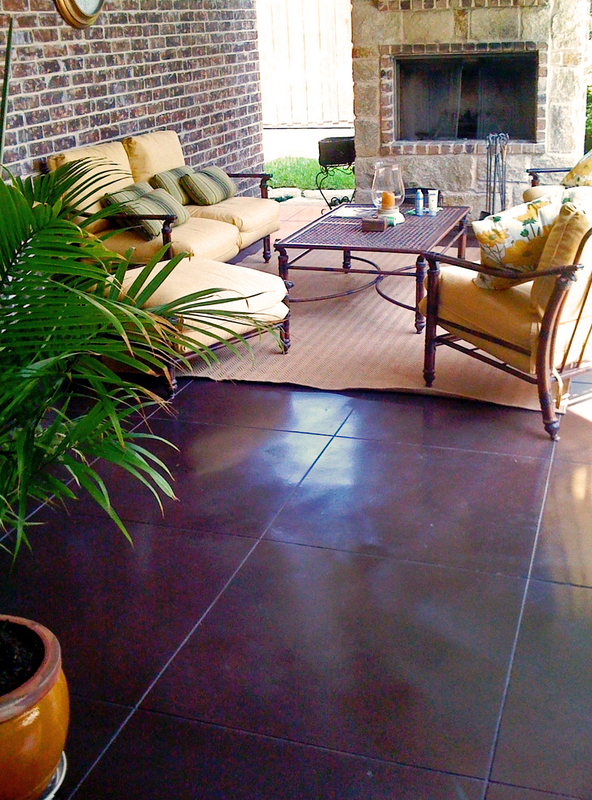 A great example of the classic Kemiko brand ‘Cola’ stain applied to porch & patio. 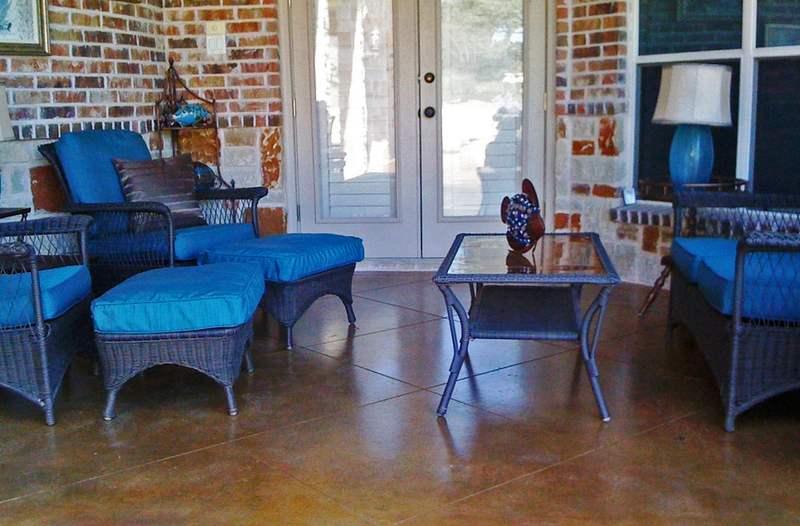 Kemiko ‘Malay Tan’ on the front porch, tan and ‘Cola’ on the spacious outdoor living area/pool surround. 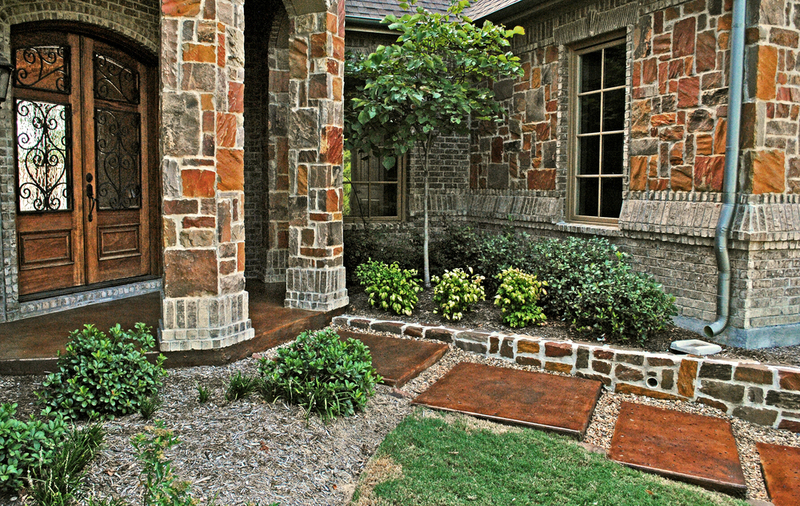 Bordered scoring accents the porch & patio. 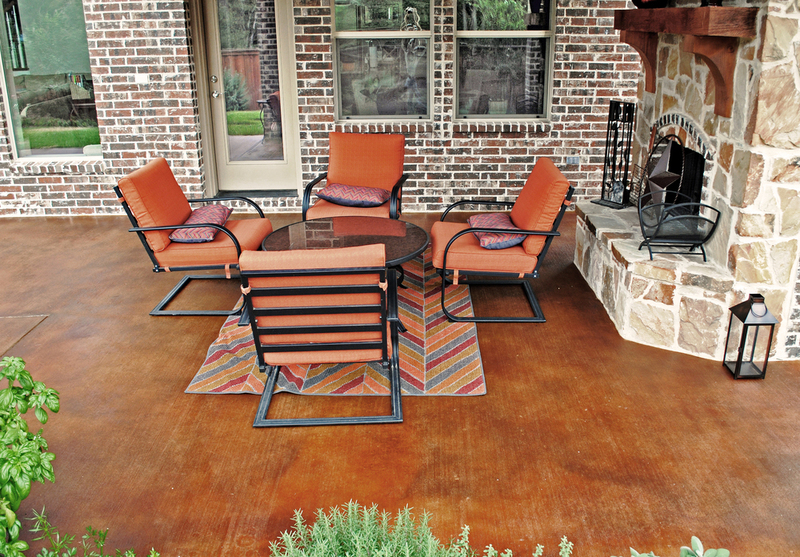 This custom leather-brown stain was chosen to provide an earth-tone contrast to the white stucco structure. Gray-tones are currently popular choices, both as primary color and as additions to other standard and custom stain colors. 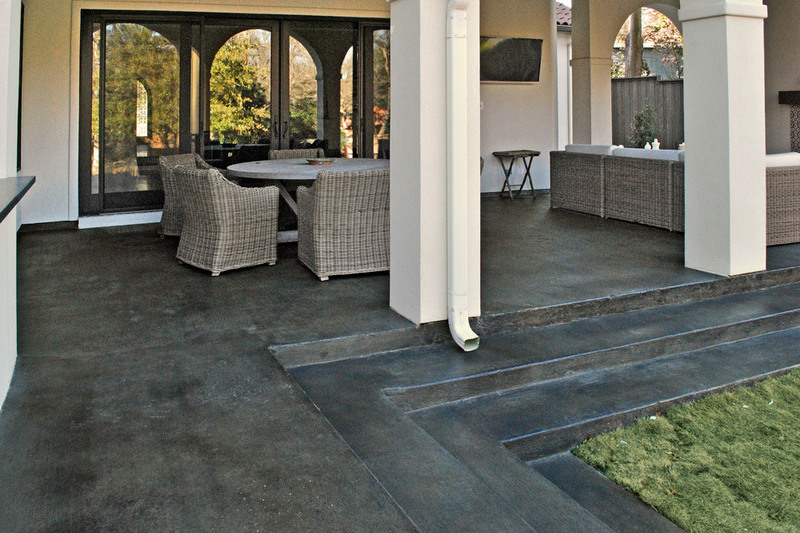 A covered patio with smooth-finished concrete, scored in a large-tiled diamond pattern. The color is a unique dark black/brown with added blue and dark red. 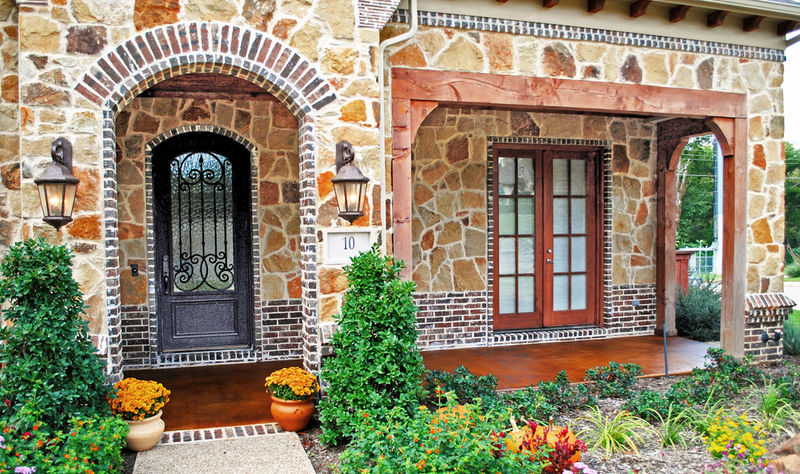 This custom color was chosen to match original trim and architectural accent colors on this vintage East Dallas home. 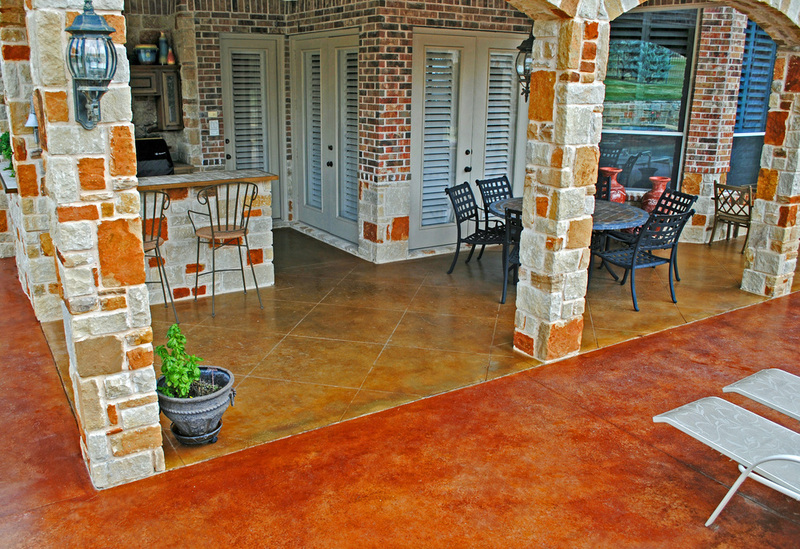 ‘Cola’ acid-stain on the pool area concrete of this new residence. 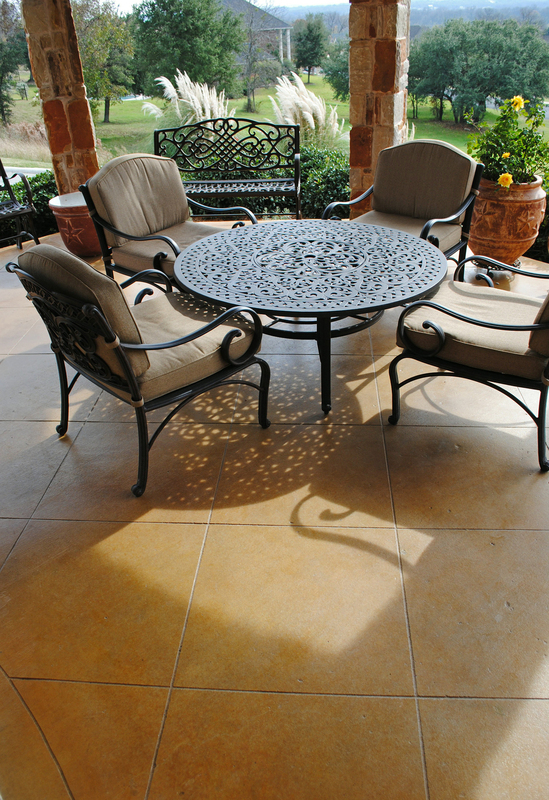 Decorative concrete as seen on various pool surrounds. 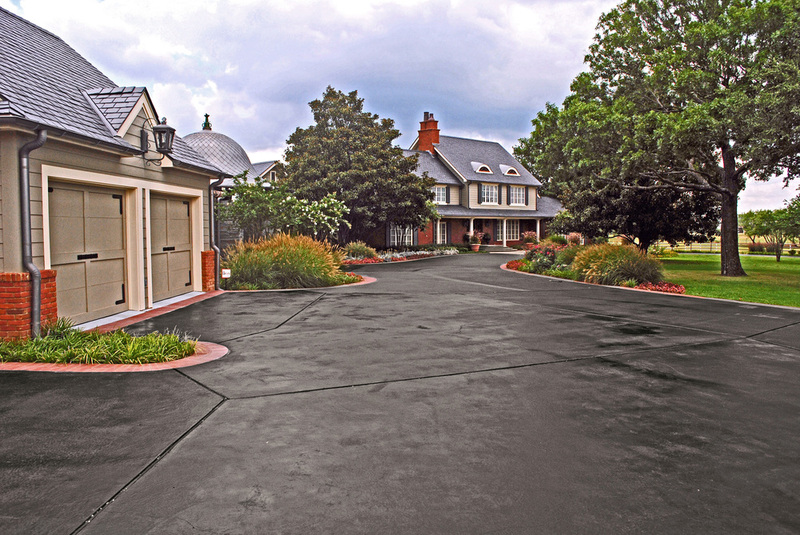 Lots of new residential driveway and parking concrete on this residence gets a dark acid-stain treatment. 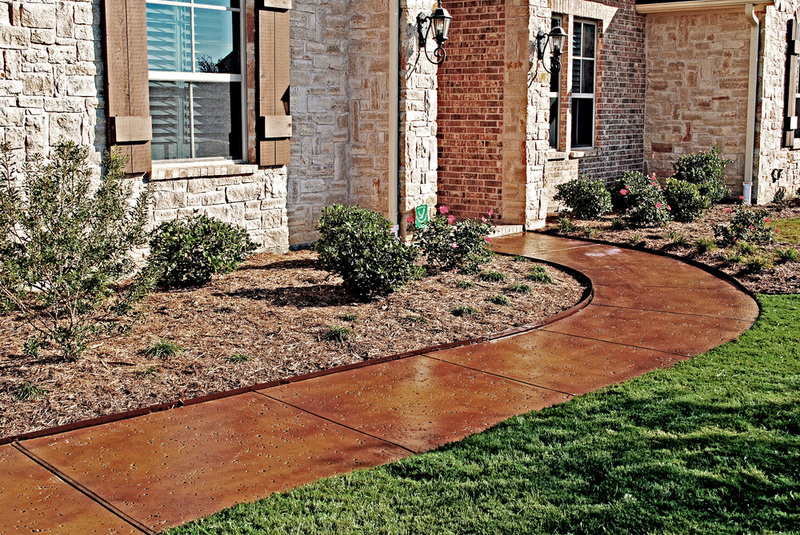 A mix of brown and black stains with additional color applied with the sealer. 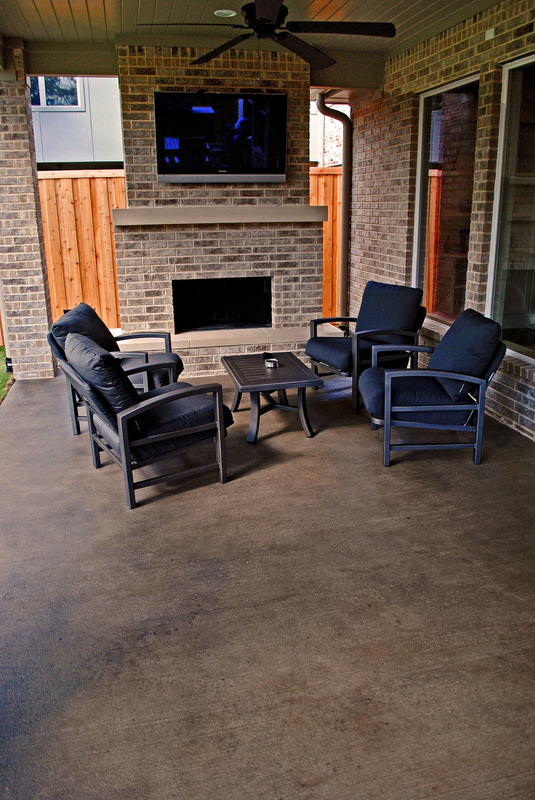 BEFORE & AFTER: the color and sealer on this townhome stamped concrete was damaged with wear and attempted remedial work. 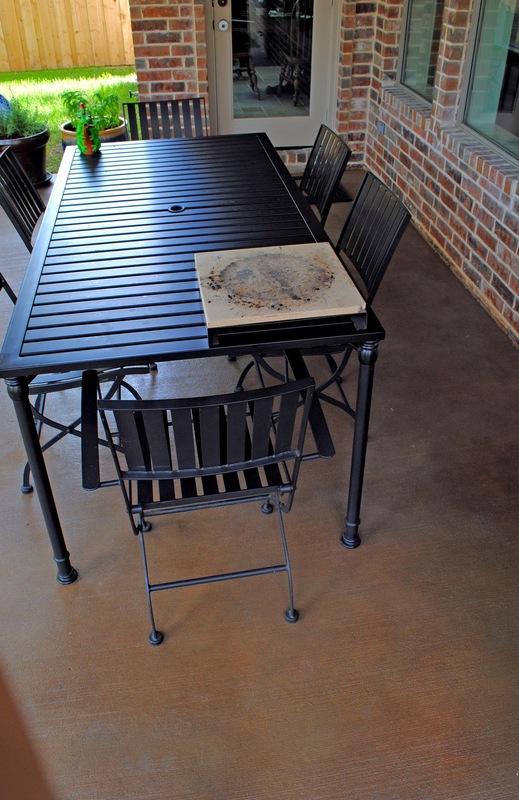 Our refinishing improves on the original as it revitalizes the surface. The irregular ‘slate’ score pattern provides visual complexity on this new patio. The color is a rich umber acid-stain. 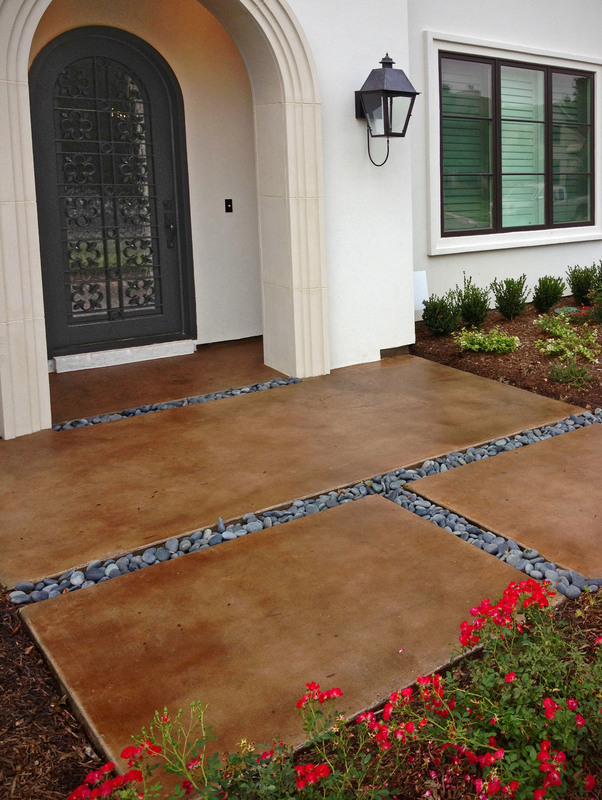 Adding interest to the walkway: various decorative treatments on smooth, broom, and salt-finished concrete. Currently popular colors include gray, charcoal, taupe, and lighter gray-tans and gray-browns (with little or no red). 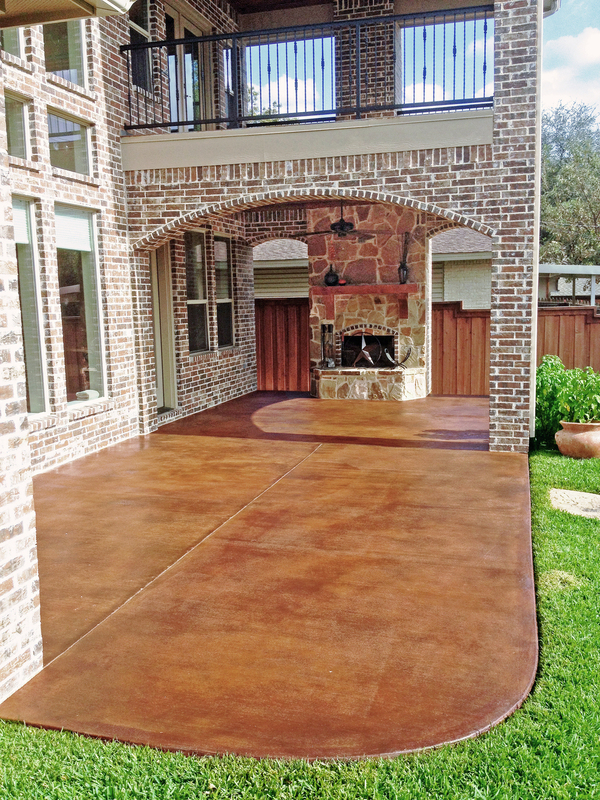 Here an exterior residential remodel provides new patio concrete to score and stain.